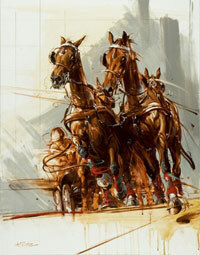 In conjunction with what is anticipated be the biggest equestrian event ever held in the United States, internationally renowned artist Andre Pater has created four paintings, depicting some of the equestrian disciplines featured in the 2010 Alltech FEI World Equestrian Games to benefit The Race For Education. 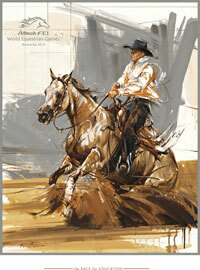 The series includes jumping, dressage, reining and driving. The paintings were unveiled at a private reception at Cross Gate Gallery in Lexington, Kentucky in November of 2009. A study of the jumping painting donated by the artist sold for $8000. 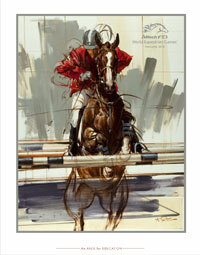 A limited edition of five hundred signed, numbered prints, bearing a silver stamp of the 2010 Alltech FEI World Equestrian Games, will be made from each painting and will be available as a gift with a $100 contribution to The Race For Education. 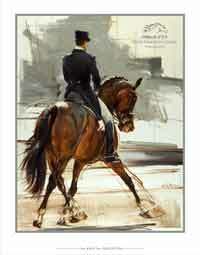 Proceeds from the sale of the prints will provide college scholarships for equestrian athletes. The Race For Education and the United States Equestrian Federation have joined forces to award the scholarships in 2011 through the North American Junior / Young Rider program. “It is an honor to work on a project associated with this important international event, but my inspiration comes from the organization and the help it provides to so many children” states Pater. 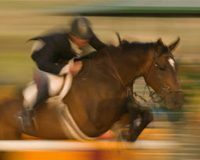 The Race For Education will host a gala reception during the 2010 Alltech FEI World Equestrian Games, at the Lexington Country Club, on September 30, sponsored by Young Rider, Horse Illustrated and Thoroughbred Times to honor Andre Pater. Honorary chairs for the event are; 2003 WEG gold medalist in Reining, Tom McCutcheon, president of the World Coaching Club, Misdee Wrigley Miller, USDF gold medalist Reese Koffler-Stanfield and ASPCA Maclay National Championship and the AHSA/Medal Championship winner Nicole Shahinian Simpson. The highlight of the reception will be the auction of the four original paintings the equine artist has created and a Rolex watch provided by Sheila Bayes Fine Jewelers. Tickets are $250 or $1500 for a table of 8. “Andre has made an incredibly generous contribution of his time and talents and I look forward to working with him over the next few months in promoting the program and recruiting buyers for this outstanding artwork. I am also grateful to the staff at the 2010 Alltech FEI World Equestrian Games for giving us this opportunity”, said Elisabeth Jensen, president and executive director of RFE. The Race For Education (RFE) enables children equine and agriculture industry families, as well as children who want to pursue an equine-related career, both with significant financial need, to obtain a college degree by providing tuition support; financial literacy training to help students minimize their debt load; mentoring services to provide students with emotional support; and assistance in finding career-related internships during college and permanent jobs upon graduation. Beautiful Pictures they nearly seem so real. I wish I could see the other paintings. Absolutely spectacular, too bad they don’t show more. This is going to be the best WEG event during Weg! !